This Web page presents a very short description of how NAOI Dynamic Investments work and the type of returns they can produce. A more detailed description is found at this page. This revolutionary investment type is the future of investing. The Dynamic Investment structure is remarkably simple and effective. A DI is a derivative investment vehicle that combines Exchange Traded Funds (ETFs) – or Mutual Funds - in an intelligent, dynamic structure. It has three design elements as shown in the nearby diagram. The Dynamic ETF Pool is where designers place ETFs that track the asset classes and/or market areas where they want the DI to search for positive price trends. The other two variables are a very simple Trend Indicator and a Review Period. At periodic Review events, typically occurring quarterly, the DI uses the Trend Indicator to rank the ETFs in the DI’s pool of potential purchase candidates. Only the ETFs with the strongest upward price trend are bought and held until the next Review event when the process is repeated. Thus, all trade decisions are made based on objective observations of easy to find market data and not on risk-laden subjective human judgments or complex computer algorithms. DIs were designed to be so simple that individuals of virtually all experience levels can implement and manage them on their own, if they wish, using an online broker. 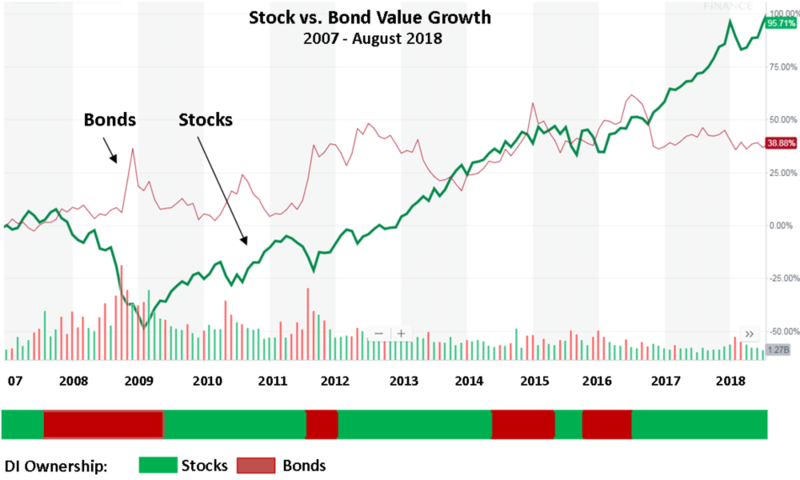 The following series of charts and a table illustrate how Dynamic Investments work and how they performed during the volatile market period from the start of 2007 to August of 2018 when these words were written. The first chart, just below, shows the value growth of a total market Stock ETF and a total market Bond ETF during the test period. Just below the chart is a bar that shows which of these two assets the simple NAOI "Primary" DI selected and held during this period. This is the simplest DI possible that only rotates between Stocks and Bonds based on the price trends of each. Keep in mind that all DI trade signals were generated automatically by the DI based on a periodic observation of market trend data; no human subjective decisions were involved. You can see that the NAOI designed DI was able to automatically detect uptrends in both Stocks and Bonds and change the ETF it held to take advantage of them while avoiding the losses of downtrends. DIs are market-sensitive while MPT portfolios are not and the difference in performance is astounding as discussed next. So, how did this simple DI perform? The chart just below illustrates that it performed extremely well. It shows the value growth of the DI during the test period. For comparison purposes, it also shows, at the bottom of the chart, the value growth of an industry standard MPT portfolio with a 60% allocation to Stocks and a 40% allocation to Bonds. You can see that the DI increased in value during this period by 1765% while the MPT portfolio increased by only 91%. And, again, keep in mind that this performance was achieved based on the use of objective data, not on subjective human judgments that would inject a massive risk element into the process! Now let's transform the data in the above chart to return and risk numbers. The table below shows the annual returns for both the DI and the MPT portfolio along with the Average Annual Return and Sharpe Ratio for each. The Sharpe Ratio measures the amount of risk received for each unit of risk taken, the higher the better. And any value greater than 1.0 indicates a superior investment. Today's financial experts will say that returns like those produced by the DI are impossible. And they ARE impossible using MPT methods. But once the constraints of MPT are lifted, returns are allowed to soar without increased risk. How Are Returns Like This Possible? To explain how DIs produce such exceptional returns let's think about the differences between DIs and MPT portfolios. First, a DI strives to hold ONLY ETFs that are moving up in price. MPT portfolios are designed to hold both winning and losing investments at all times and thus severely limiting their returns. DIs are capable of changing the ETF they hold based on a periodic sampling of market trends. MPT portfolios are static and blind to market movements. As a third difference, DI trades are made based on objective observations of market data while MPT portfolios only change based on human judgments that inject a massive risk element into the trade decision process. How Do Dynamic Investments Change the World of Investing? The Productization of Investing - DIs have a universal goal of maximum returns with minimum risk in all economic conditions. This is a universal goal that works for all investors regardless of their risk tolerance level - there is no need to customize portfolios for each investor. Thus, each DI is a portfolio product that can be bought off-the-shelf from a variety of vendors. This is the much sought after “Productization of Investing”. Advisors can easily recommend DIs to a client from a DI catalog without going through the lengthy and error prone process of customizing portfolios to match risk profiles. This frees up Advisor time to provide more financial planning services to their clients which is what they need most. The Primary DI is a standardized benchmark for measuring the performance of all portfolios. Thus, we now have “portfolio Alpha” which is defined as how much better an MPT or DIT portfolio performs against the simple Primary DI performance benchmark. Dynamic Investments employ 5 risk reduction factors, MPT portfolio use only 2. DIs are easy to create, unlike mutual funds or ETFs. They are created by simply combining ETFs in the DI structure. It is easy to see how Dynamic Investments usher in a new and better world of investing. The NAOI provides to financial organizations a range of products and services that will enable them to take full advantage of Dynamic Investments. Among these are education seminars, consulting contracts, research partnerships and a catalog of powerful Dynamic Investments that can be used immediately. Form more information contact Leland Hevner directly at LHevner@naoi.org. More information is found at these Web Sites: www.naoi.org and www.DITheory.com. Consider signing-up for NAOI Email Updates at the bottom of this page to be alerted when Dynamic Investment developments occur.